What's the New Catch at the Pumpkin Patch? - Word on the street with Visit Minot!Word on the street with Visit Minot! Fall is just around the corner, the crisp cool air, the leaves changing color, and all the fun things to do at Berry Acres Pumpkin Patch! There is so much to do at the Pumpkin Patch and there are new things to do this year! 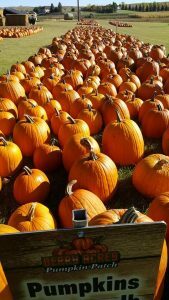 Just like previous years, there is a pumpkin patch with pumpkins for sale, Berry Acres is the place to find that perfect pumpkin to carve. 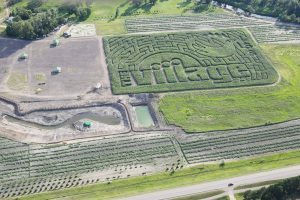 The is a corn maze, an eight-acre corn maze! The logo of the corn maze this year is The Village & Lutheran Social Services of North Dakota (Pictured Below). Pumpkin picking and the corn maze are perfect for all ages! There also is Bales of Fun with slides, an Obstacle Course, Pedal Carts, Corn Box, and a Fishing Pond! The Fishing Pond is new this year and is a catch and release pond. 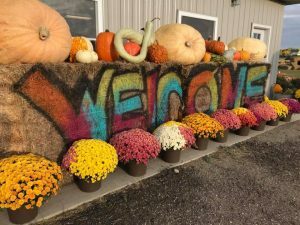 But just wait, there’s more, also at the Berry Acres Pumpkin Patch is Mini Golf, Pumpkin Cannons, Hayrides, Paintball Wagon, Train Ride, Laser Tag, Chipping Golf, and a Petting Zoo. The Pumpkin Patch is filled with fun photo opportunities for the kids, family, couples, EVERYONE! Berry Acres will open September 15th at Noon. They will be open 7 days a week until October 28th. Monday – Friday – 12-7:00 p.m.
Saturdays – 9:00 a.m.- 7:00 p.m.
Sundays – 11:00 a.m. – 7:00 p.m. The Berry Acres Pumpkin Patch is perfect family fun for this Fall season! Berry Acres is located at 4605 County Rd 15 West Minot, 1 mile west of bypass 83. You can check out their Facebook page for more information.